Hello all you lovely Frugal Foodie Mama readers. I'm Lauren & I blog over at Tutus & Tea Parties about parenting, crafting and a few things in between. I'd love for you to stop by & say hello! I'm so happy to be here today to share an easy DIY gift tutorial with you today. Gift giving gets so overwhelming, not to mention expensive! My thought is: handmade is the best! It's cheaper than buying & it's made with love. How can you beat that?! 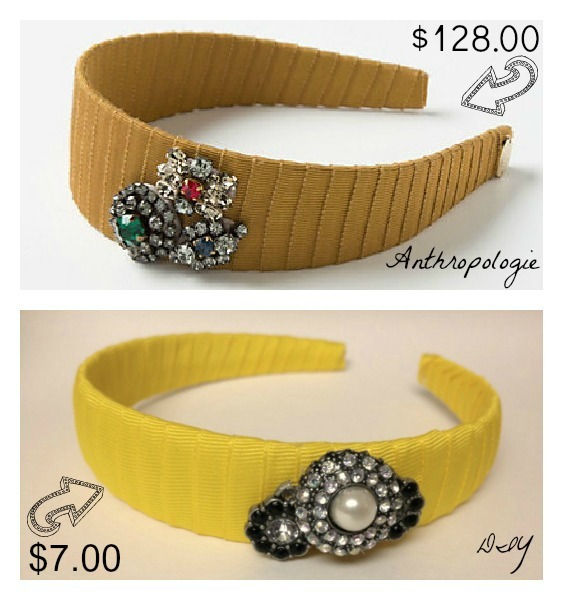 How lovely is this mustard bloom headband from Anthropologie? I just love the color and the accents on it! Only problem...it's $128! Ouch. Well, good thing I have a tutorial for you today to make this baby for less...way, way less! Cut two short strips. Heat set the edges with a lighter or match flame. Wrap the ribbon around, overlapping just a little each time around. Glue on your brooches & wrap it up for someone special (or rock it after you see how awesome it is...and make another to gift). Easy peasy, right? And it will make a great gift for your fashionista friends. Thanks again for having me here today. Hope to see y'all around blogland soon! hmmm... I kinda like yours better :) Very cool project! The top headband was $128?!?!? Geez! DIY all the way!